Websites and services that you open in Google Chrome may use the browser's audio playback capabilities to play audio. While audio playback is wanted most of the time, for instance when you click on the play button on YouTube to play a video or on Spotify's website to play a song, it is sometimes done without user interaction and often unwanted as a consequence in these situations. Sites may display advertisement that uses audio, as video ads with sound, or play videos automatically when you visit them. There are other forms of audio content that you may find disruptive. Update: Google launched new video with sound autoplay blocking functionality in Chrome 66. Chrome uses an engagement index to determine whether video content with audio should play automatically on sites you visit or not. Tip: Check out our How to control audio and video autoplay in Google Chrome guide to find out how to control autoplaying media in the browser. First tab muting extension appeared in 2011 for the Chrome browser. The free extension MuteTab added basic audio muting options to Chrome. The extension lists sites that play audio and options to run mute and other audio related commands on the identified sites. Google began to experiment with tab audio notifiers in Google Chrome in 2013; first, powered by the startup flag --enable-audible-notifications which Chrome had to be launched with, and then later on as a built-in feature that was enabled by default. Chrome would displays a new icon on tabs that played audio to indicate to the user that audio was played on that site. Tab audio indicators are part of any new version of Chrome. 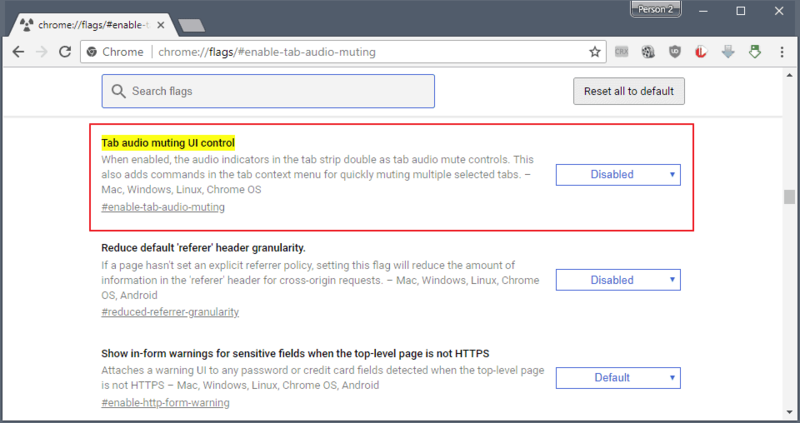 Google added an audio muting flag to Chrome in late 2014 which users could enable to mute the audio on sites by clicking on it. The, very comfortable, option is still experimental up to this day. Google changed the tab muting functionality of the browser in 2017. The company removed options to mute individual tabs in the browser in favor of a site-wide mute. 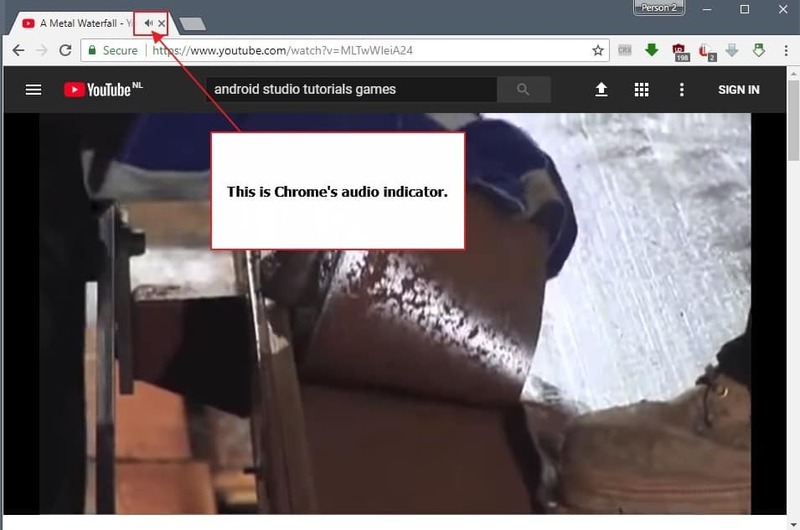 Google Chrome displays audio icons on tabs when a site plays audio. Google Chrome supports tab-based audio muting controls. 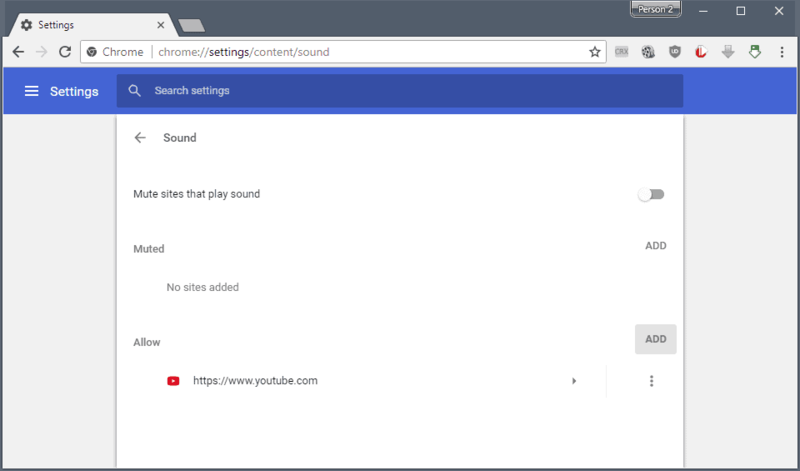 Chrome supports Sound controls to allow or blocks sites from playing audio, or display a prompt whenever an attempt is discovered. If you play a video without audio, no audio icon is displayed in the tab in Chrome. Chrome does display the audio indicator if the browser itself is muted in the operating system. The main option to mute the audio that plays on a site is to use the right-click context menu of tabs. Just right-click on the tab that plays audio and select the "mute site" option to turn audio off. Chrome did support another option that made things even easier but Google decided to remove it recently. The browser supported an option to display a sound toggle in the tab itself; this meant that you could click on it to mute or activate audio playback for tabs individually. You can enable audio muting in Chrome to add muting functionality to the audio indicator that Chrome displays when a site plays audio. Load chrome://flags/#enable-tab-audio-muting in the browser's address bar. Flip the preference to Enabled. Once you have restarted Google Chrome, you may hover the mouse cursor over the audio icon of the tab and left-click on it to toggle the audio playback state between mute and unmute. As of Chrome 64, hitting mute will mute all tabs of the site in question and not only the page of the site you clicked the audio icon on. 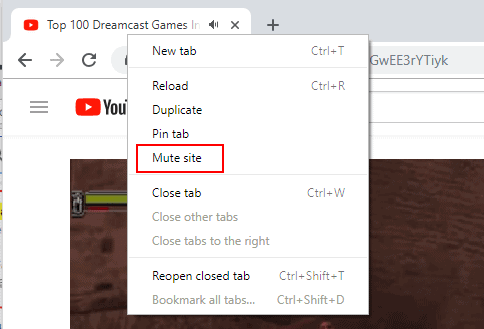 While you can mute sites in Chrome quickly by right-clicking on a tab and selecting the mute option, you may also use the audio controls of the browser's Site Settings. Block audio on specific domains or websites. Block all audio on all sites, and whitelist on specific websites. The first option is useful if you visit websites regularly that play audio that you want blocked. The second option suppresses audio on all sites but gives you options to whitelist audio on select websites. You may block sound on specific sites only in Google Chrome. The browser offers two options for that. Load chrome://settings/content/sound in the address bar and add sites to the "muted" list by clicking on add, typing a domain name and selecting add again. By clicking on the icon in front of the address in Chrome's UI, selecting Site Settings, and changing the "allow (default)" sound setting to "block". 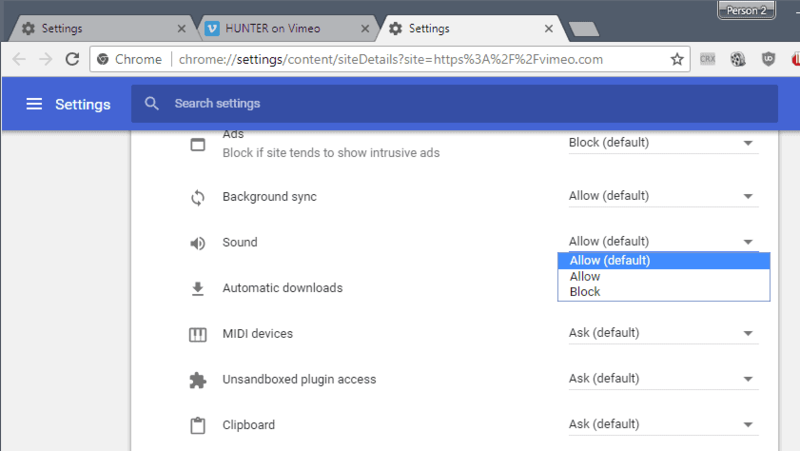 You can configure Chrome to block audio on all sites by default. This mutes sound in the whole web browser but you may add sites to a whitelist to allow sound playback on those sites. Load chrome://settings/content/sound in the Chrome address bar. Flip the "allow sites to play sound (recommended)" switch so that it is set to "mute sites that play sound". You may add sites to the whitelist by clicking on the add link next to allow. Just type the address of the site, e.g. https://www.youtube.com/ and the add in the prompt to add it to the whitelist. Chrome blocks audio on all sites but on whitelisted sites. The browser displays a muted sound icon on tabs of sites that play audio, and displays another indicator in the address bar. You may interact with the address bar icon to allow sound on the site by adding it to the whitelist. Chrome displays two options when you click on the icon. If you want to allow playback, select "always allow sound on" and then done to make the change. Find out how to configure Chrome to enable audio muting controls directly in the browser's tab bar, and how to mute sound on entire sites, or all websites but whitelisted ones. You can make whitelist in Chrome? I see nowadays Chrome has more features than Firefox.. Yes, you can block the functionality for all sites but sites you added explicitly to the whitelist. This works for sound but also other browser features such as notifications. Thank you for this tip. Very useful. Chrome gets new features from time to time and we do not have the time or knowledge how/what to follow. Some explanations sometimes result in more questions than are supposed to, but are solved with guides like this. Do you think you could write something about hardware acceleration as well? Chromium allows you mute audio for individual tabs similar to how FF does it. Has for quite a while. Maybe Chrome will catch up. like to mention, that Chromium based Browsers can be speeded up through the chrome://flags settings as well. Go chrome://flags, choose GPU rasterization MSAA sample count and set it higher than default. Works with Chrome, Opera, Vivaldi. Speeds up Pageloading from default (2) to blazing fast (16). Works like charm for me. Hey, thanks very much for the much needed and good-read article. So it seems the audio icon on chrome tabs has been removed from Chrome after the Aug/Sep 2018 update. What do we do now? I still see the audio indicator in Chrome 69. In which version do you say has it been removed? As of v71.0.3578.98 it looks like Google removed the “enable-tab-audio-muting” flag and we’re forced to use site-wide mutes.